The National Center for Free Speech and Civic Engagement in Washington, D.C., will open as part of a concerted educational, research and advocacy effort centered on the First Amendment's critical importance to American democracy. Interested in applying for a fellowship? Sign up to receive information. Watch a video on the new center here. 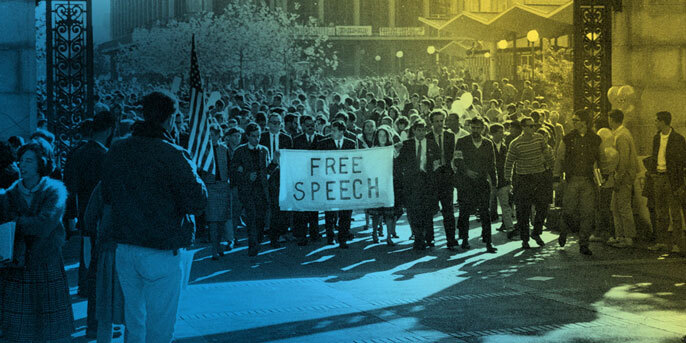 The University of California — birthplace of the Free Speech Movement — will open a center in Washington D.C. devoted to research, education and advocacy on issues of free speech and civic engagement. The National Center for Free Speech and Civic Engagement will be housed at the UC Washington Center (UCDC). Through an annual fellowship program, the center will bring together leading legal scholars, social scientists, journalists and others to conduct research, offer seminars and mentor UC students. The center will also provide a hub for activities and events aimed at restoring trust in the value and importance of free speech, the president said. UC Berkeley Law Dean Erwin Chemerinsky and UC Irvine Chancellor Howard Gillman, both noted constitutional scholars, will co-chair the advisory board that selects each year’s class of fellows. The application for the one-year fellowship will open next month. A UC affiliation is not required to apply. Up to eight fellows, representing a range of disciplines and backgrounds, will be invited to spend a year conducting research and advancing the national conversation on policies related to free speech and civic engagement. Fellows will also spend a week in residence at one of UC’s 10 campuses. Funding for the center and its activities comes from the president’s endowment and private philanthropic giving. A national conference, to be held in 2018, will allow the fellows to share their research and create an opportunity for elected officials, university leaders and others to come together to explore new approaches for engaging and educating students about the critical role of the First Amendment in American democracy, Napolitano said.